PHOENIX – Chris Spahle’s last bike was stolen from right in front of the downtown building where he works. If that happens with his current bike, the Phoenix Police Department has its serial number, a picture and his contact information in a database. 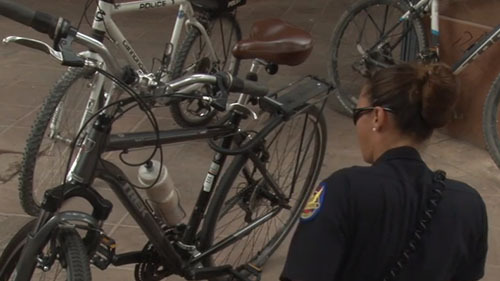 Should he report the bike stolen, police can look for a white sticker on its frame showing it’s part of the new Back-Up Your Bike program, a collaboration between police and the Downtown Phoenix Partnership. “It just shows that they are thinking of ways to help, of being proactive not reactive,” said Spahle, who brought his bike to the first registration event Tuesday. Sgts. Brian Bachorski and Jared Lowe created the free program. In order to register a bicycle, an owner needs to fill out an agreement and provide contact information and a description. The bicycle’s information is run through a database to make sure police don’t register any stolen bicycles, Lowe said. If the bicycle checks out, an officer places a tamper-proof registration sticker on it and takes a picture for the database. “The sticker is made specifically for bicycles. If they do come off, it will fragment and the word ‘void’ will come across,” Lowe said. Amanda Stanko saw signs promoting the registration event at Arizona Center and returned with her bike. 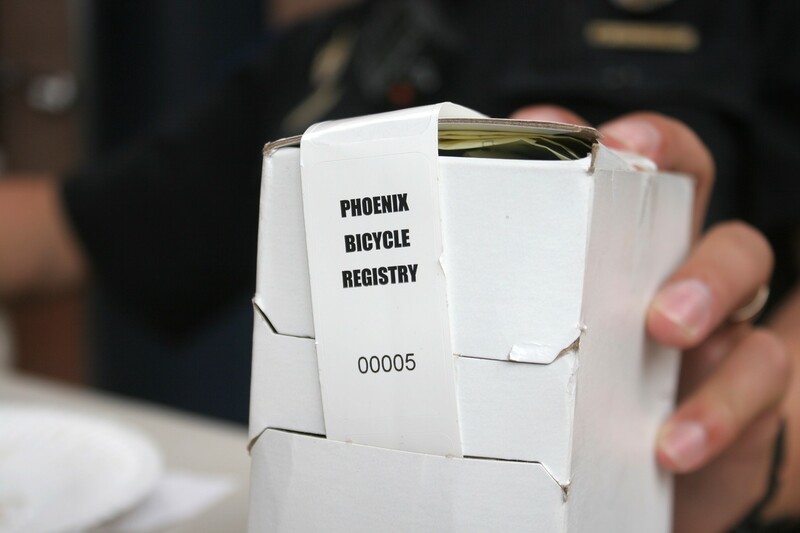 The long-term goal is to have every bicycle in the downtown Phoenix area registered, including bicycles already registered through Arizona State University. For the Downtown Phoenix Partnership, which provided supplies for the program, the collaboration grows from a great relationship with the police unit serving downtown, said Samantha Jackson, the organization’s community services director. 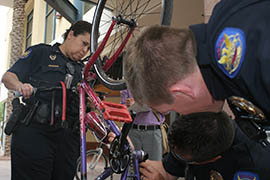 Phoenix Police held their first "Back Up Your Bike" event in Downtown Phoenix. Cronkite News reporter Elle Johns gives us more on the story. Police look over a bicycle being registered for the Back Up Your Bike Program. Stickers identify bicycles registered under the Back Up Your Bike Program.